What are C15 Power Cables? > Blog > News > What are C15 Power Cables? The C15 power connector is not too dissimilar to a C13 connector, but has a small notch at the bottom, under the earth pin. Historically, the C15 3 pin power connector was used only for high voltage devices, hence often referred to as HOT conditioning. However, it’s now becoming the IEC connection of choice for many of the switch and server manufacturers, including Cisco, HP and DELL. 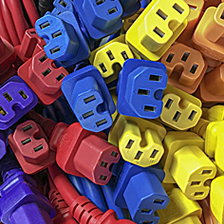 C15 power cables are typically referred to as an IEC or jumper cable and would normally have a C14 plug on the other end. The C15 cable would be connected in to the equipment that has a C16 Inlet, for example a PoE network switch. The C14 at the other end of the cable would then be plugged in to either a PDU (Power Distribution Unit) or a UPS (Uninterruptable Power Supply) to connect the devices together. This type of C14-C15 power connection is now common place within an IT environment, such as a server room or data centre. The 10Amp version of a C15 cable has a temperature rating of up to 70°, where as a 15Amp version would be rated up to 120°. Both the 10A and 15A C15 power cables are used within the UK, depending on the IT equipment’s power supply requirements. They are both made using flexible PVC power cable however, the 15Amp will be of a thicker construction, so typically nearly twice the diameter. The C15 cable connector is backwards compatible with a C13, although C13 connector will not physically fit in an inlet that is designed for a C15 due to the small notch. This C15 notch creates a much more secure fit for the power cable, so you are less likely to experience accidental disconnects or cables becoming loose overtime due to vibration. These C15 cables are available in multiple lengths and colours. Also available is a choice of angled C15 left and angled C15 right cables, creating improved cable management in tight spaces. The C15-C14 cable is set to be the new standard when connecting your core IT infrastructure.